Located in the highest part of Ostuni, where the air is clear and the views far reaching. An amazingly tranquil location set in a mature terraced garden with panoramic views over the Itria Valley. Set in a tranquil spot up in the high hills of Ostuni going out towards Cisternino. The villa will provide modern living with 2 bedrooms and 2 bathrooms, the spacious master bedroom with ensuite bathroom and fireplace leads directly onto a veranda. The living room extends to about 20 sqm with open plan kitchen and guest bathroom, the living room leads out through large patio doors onto a spacious veranda where you can enjoy outdoor dining and provides an extension to the indoor living area to provide an indoor/outdoor living experience. Leading down to the pool is an outdoor BBQ area and relaxing area to sunbathe by the infinity edge swimming pool that is built into the terrace of the garden. From the pool you can enjoy far reaching views over the countryside and towards an old masseria which creates a beautiful backdrop to the landscape. The 3 cone Trullo provides a separate guesthouse with little kitchenette and bathroom. It leades directly out onto a spacious relaxation area. The garden extends to about 1 hectare with various relaxation areas, under the pine trees you can relax in the shade in a hammack. The land has various olive, pine and eucalyptus trees plus various fruit trees almond, fig, prickly pear and apple. 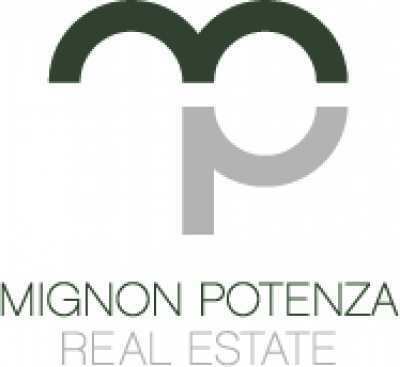 Mignon Potenza was established by Donna Mignon, originally from the UK but with a real passion for Southern Italy – the people, the warmth, the lifestyle, the food, the sun and the beautiful Adriatic coastline. Donna has lived in Puglia for the past 5 years where she works and raises her son – she believes that Puglia is the ideal place to live and raise a family.Donna has over 15 years commercial and residential property experience in the UK and across Europe. A Chartered Valuation and Investment Surveyor working for over a decade for one of the top 10 Chartered Surveying firms in the UK focusing on Strategic Investment Asset Management.In addition she acted as Consultant for International Investment with a primary focus on Italian Real Estate Investment, representing clients from across Europe and the US looking to purchase in Italy.Donna’s passion for all things property related and all things Italian blends perfectly to help you.Her expertise is not only in residential and commercial property arena, mainly specializing in Shopping Centres, from Investment Analysis, Valuation to Agency work in the UK and Italy.In addition to her mother tongue English, Donna also speaks French and Italian. For her language abilities, real estate experience and expertise and her overseas contacts Donna is always being approached to market Italian real estate abroad – this provides her with a unique insight into available real estate in Italy at any time.Mignon Potenza offers a completely integrated service to buying property in Italy – including full management of the buying process in addition to key support services.